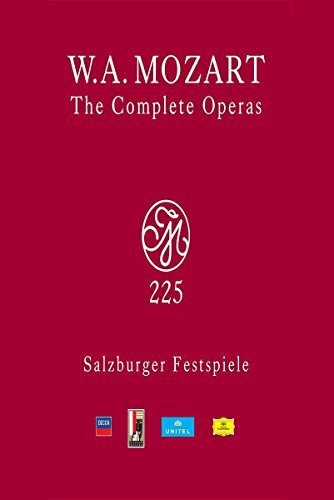 The Complete Mozart Operas, including his early and lesser-known operas, every Singspiel, and orchestration of scenic fragments, presented in the most beautiful edition ever created. This collection, the largest audio-visual Mozart project of all time, presents over 47 hours of live recordings, 112 solo performers, 14 directors and 16 conductors including 12 orchestras. On these complete live recordings, which were the culmination of the Mozart Year celebration in 2006, all the Salzburg Festival s own productions appear a marathon of music on 33 High Definition DVDs in 5.1 Surround Sound, presented in this deluxe edition. Included are - making-of - bonus material, artist interviews and rehearsal excerpts, providing insight into the Festivals preparation and an introduction to the music, making this Edition invaluable to Mozart scholars as well as concert-goers. Many of the lesser-known works included in this set had not been seen in any video format before this set was originally issued. This collection recognizes and honors Mozarts life, 225 years after his death, and is the perfect accompaniment to the landmark Mozart 225 Complete Edition. Soft touch case with magnetic close fastening, with artwork complementing the Mozart 225 Complete Edition.